Selene Ramirez. Photo by Zocalo Public Square. The impact of transportation on social mobility is stronger than several other factors, like crime, elementary-school test scores or the percentage of two-parent families in a community, said Nathaniel Hendren, a Harvard economist and one of the researchers on the study. It notes the connection in places with notoriously long commutes and poverty including Atlanta, Boston, Dallas, Denver, Los Angeles, New York, Orlando, Fla., and Birmingham, Ala.
A New York University report found much the same thing — areas with some but inefficient access to transit had the most unemployment. I don’t think the findings are exactly shocking, but they are interesting. And they certainly reinforce the point that a big robust transit network does more than just help people avoid traffic. The OC’s plans to widen the 405 freeway between Costa Mesa and the L.A. County line earns the wrath of Streetsblog editor Damien Newton, who argues that widening the freeway will create even more traffic. He also says that will inevitably lead to Metro funding a widening between the county line and the Westside to prevent a bottleneck. A Metro official recently told KPCC that there’s no funding for such a project although the agency plans to do a feasibility study of a widening for five miles of the 405 in Long Beach to see if that’s something even possible. The one thing that’s certainly interesting about the OC’s plans are that the widening will allow for two HOV/toll lanes in each direction. Phil Washington begins at Metro’s new CEO on May 11. His salary was announced when the Metro Board hired him in April; the LAT article takes a look at some of the other benefits. For those interested, Metro’s website does have a page listing salaries for executive-level positions. Another New York Times story with more New York attitude toward L.A. will surely raise the hackles of some and inspire a wave of indignation toward San Francisco East. 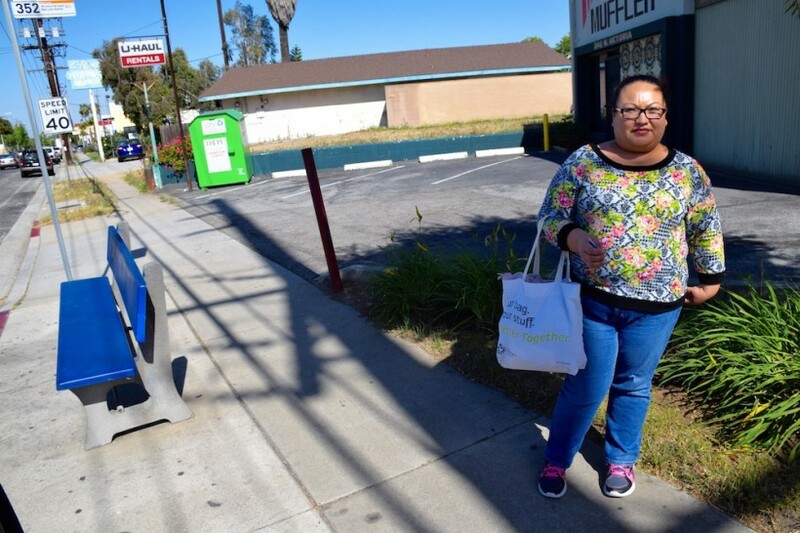 In this article, a reporter travels to L.A. and tries to get around to a variety of destinations using only Metro, Commuter Express buses (run by the city of L.A.), the FlyAway bus from LAX (also run by the city) and Metrolink. Soon I was gliding through downtown, surrounded by commuters. The Orange Line terminated at North Hollywood, where we descended to the Red Line. A subway in Los Angeles: What a concept! A clean, well-appointed subway at that, with a train that arrived within minutes. As my colleague Joe Lemon noted, the reporter probably would have been better off staying in downtown L.A. rather than an unnamed hotel near the 405 freeway (I’m guessing the Luxe at Sunset and the 405). The reporter also says he used Metro’s trip planner but let’s face it: savvy Angelenos often check both the trip planner and Google Transit, which sometimes have different ideas about getting from Point A to Point B. All that said, I thought the story was fine — the fact is that learning another city’s transit system usually takes some time. Nor do I mind some transit indignation from those traveling from Gotham to L.A. After all, 56 percent of Gothamites use transit to commute to work versus 11 percent of Los Angeles workers, according to the Census Bureau. And let’s face it: Metropolis has 232 miles of subway system versus our 87 miles of subway and light rail, not to mention three busy commuter railroads and the PATH trains that connect Manhattan to New Jersey. Why do you think Superman, Batman and Spider-man all reside in Metropolis/Gotham/SF East? There’s a lot more trains to save from the Ras Al Ghuls and Doc Ocks of the world! All that said, I think it’s worth mentioning that the NYT reporter probably would have benefited from several Measure R projects in the works, most notably the Crenshaw/LAX Line (which will include a station that will connect to LAX terminals via a people mover to be built by LAX) and perhaps the Purple Line Extension, which will eventually connect downtown L.A. to Westwood. The reporter would probably have been smart to do what those visiting Apple Grande and most other cities do: get around by various means, including transit, taxi, rideshare and foot. On our end of things, I think our area — Metro included — probably could do a better job providing mobility advice to those visiting our area. Your thoughts on the NYT article, readers? You can follow me on Twitter and Instagram for my mostly non-transit blatherings and pics. I politely suggested to him that Metro’s app as well as Transit App, Moovit, Citymapper and Next Bus to name a few would have helped him better navigate LA without a car. Speaking with a bit of prejudice, of course, but I was glad to see the reporter’s path led to the train-to-plane connection at Burbank Bob Hope Airport. It bodes well for the coming Antelope Valley Line station at Hollywood Way and San Fernando. He also missed the presence of the Airport’s Super Shuttle connection to both the NoHo Red Line Station and the Burbank Station, but he still put the route together on his own to make it to the Airport. Commuting around LA by bus is a frustration endurance test. Bus stops everywhere, served (and only intermittently at that) by all kinds of different providers none of whom work in concert with one another, just like the writer says. If you are savvy (and have a smart phone), you can use the metro app which will tell you “the 20 bus will arrive in 3 minutes” for the next 10 minutes or so until, whaddaya know, a 720 arrives. I used to take the 733 and it was constantly filled to crush capacity. In the afternoons, it would generally take 3 buses before one arrived that wasn’t discharge only. In the mornings, my “last-mile” bus connection took up a full 30 minutes of my commute. And, talk about abuse, it is stunning how much awful sexual harassment and verbal abuse you see on the buses. The vast majority that I’ve seen was directed at female bus drivers. Basically Metro buses are not something you ride if you have a choice. I’m planning a trip to Los Angeles next year. My preliminary itinerary is completely different from John Hanc’s in the following: (1) Mr. Hanc flew to LA, I’ll be traveling on Amtrak; (2) He went there on business, I’ll go there for pleasure as well as visiting a friend who lives in Corona; (3) he stayed at a hotel in the San Fernando Valley but I’ll stay closer to a rail station of some sort, either in Santa Monica (hopefully when Expo Line Phase 2 opens), Hollywood (Red Line), DTLA, Pasadena (Gold Line) or, with a little luck, with my dear friend and her family in Corona (near Metrolink’s N. Main Station). I can’t speak for other New Yorkers, but what LA has done with mass transit (subways, light rail and commuter rail) really is miraculous considering that there the first (modern) rail line opened 25 years ago! What the City of Angels is doing is similar to what “Apple Grande” did to expand the subway system a century ago: agressively building more transit lines to go to more places where people live, work and play. This 405 expansion is an example of the problem with taking away transportation funding and planning from Caltrans and giving each county its own little fiefdom. We have this hodgepodge of a transportation system. OCTA is anti-mass transit. Developers like Donald Bren want sprawling tracts to maximize the profit on their landholdings. Donald Bren controls OCTA and the Board of Supervisors, so he gets what he wants. Each county is already their own fiefdom. Why do you think sales taxes are cheaper in OC compared to LA County? Orange County needs to read the theory on induced demand and maybe then they will stop wasting money on freeway / toll lane expansion.